In the vernacular, Chicago has its “Bean” (Anish Kapoor’s sculpture actually titled Cloud Gate) and now Los Angeles has “The Rock” (its nickname picked up as it rolled through four counties and 22 cities). 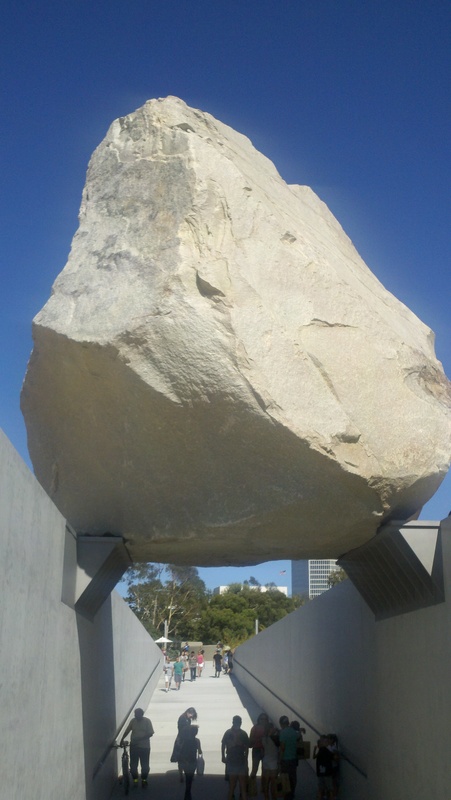 I am speaking of artist Michael Heizer’s new permanent installation Levitated Mass at the Los Angeles County Museum of Art. With this megalith, Heizer has once again—through his uncanny ability to tap into our collective past—conjured up a primeval age. Regardless of whether one thinks of the new work in popular or in more lofty terms, both represent high civic aspiration. Heizer is one of the giants of what we now term “Earth” or “Land Art” (the subject of an excellent exhibition currently at the Museum of Contemporary Art, Los Angeles, which will be reviewed here shortly). Regrettably absent from MOCA’s major survey show, the artist is happily represented elsewhere this moment in L.A. with the debut of this monumental sculpture. It was unveiled at LACMA at a public ceremony on the 24th June. There was the usual round of remarks by city, county and museum officials. But Los Angeles City Mayor Antonio Villaraigosa made a particularly insightful one, saying that Heizer has brought the desert to the city, all the more appropriate as L.A. is really a desert city itself. LACMA director Michael Govan aptly spoke about the importance of civic monuments, and connected the dots between Heizer’s evocation of Antiquity and the longstanding tradition of the great European powers’ appropriation of ancient monuments to decorate their capitals (think Rome’s Vatican Square or Paris’ Place de la Concorde). The tradition extended to the New World with our capital’s Washington Monument (begun in 1848) and the custom of appropriating an ancient Egyptian monolith was emulated by New York City with the erection of “Cleopatra’s Needle”—an obelisk actually from the time of Thutmosis III—in Central Park in 1881. Govan’s inference was clear—Los Angeles with its own monolith and in august company, has now arrived. 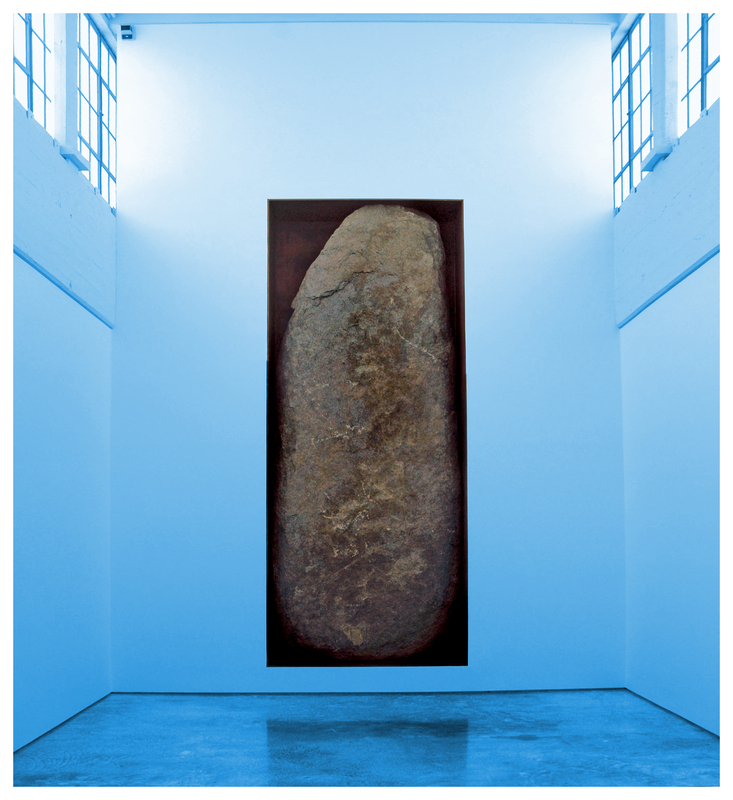 Heizer often uses a related term, “megalith,” as a title or description in his work, and the “large stones” he selects appeal to us on a very fundamental level. Great stones and monuments of stone have been markers for human history and achievement throughout time immemorial. The first expressions in or on stone date back 40 millennia with ancient cave paintings. Five thousand years ago we started erecting monuments like Stonehenge on the plains of England and 4,500 years ago the Great Pyramid of Khufu at Giza was completed. Five hundred years later the great temple complex at Karnak with its pylons, hypostyle halls, obelisks and temples began to rise. Now LACMA has erected its own Stonehenge, its own Karnak obelisk. It is satisfying to see LACMA’s campus more or less complete with the addition of Levitated Mass, with no more construction fences and the landscaping completed. The resulting shift in energy from the Times-Mirror Courtyard of the 1980s on the east side to the Renzo Piano-designed western half of the campus of today is fascinating. 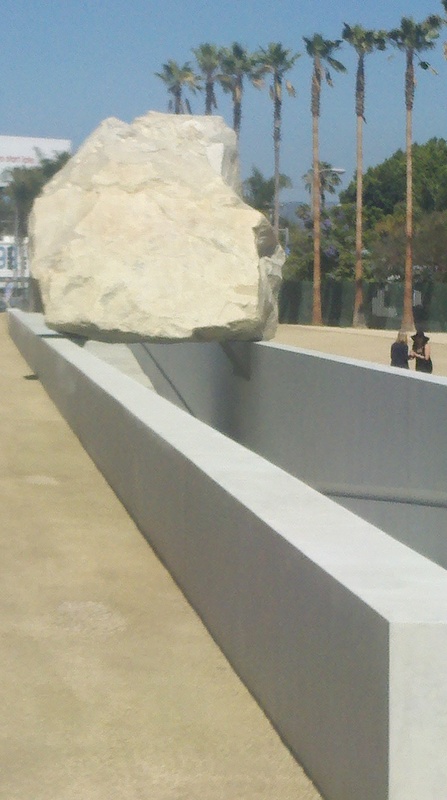 While I was initially concerned about the ability of the rock Heizer chose from a quarry in Riverside County to carry, in scale, the expanse of that part of the campus, the rock’s size (340 tons) holds its own both within its setting and against the adjacent Resnick Exhibition Pavilion. The rock sits atop an almost 500-foot long slot, which is executed in poured concrete and metal. As the viewer walks into the slot, he descends to the lowest point 15 feet down, to see the rock “levitating” above him (it is set on heavily ribbed steel brackets, which ideally might have been less conspicuous, but for obvious reasons had to be substantial). All is surrounded by a subtle rusted Cor-Ten steel ellipse filled with crushed granite, evoking the terrain whence the Rock came and Heizer’s beloved desert landscape where he normally works. In the desert of Nevada, Heizer is reportedly nearing completion of a monumental project called City. 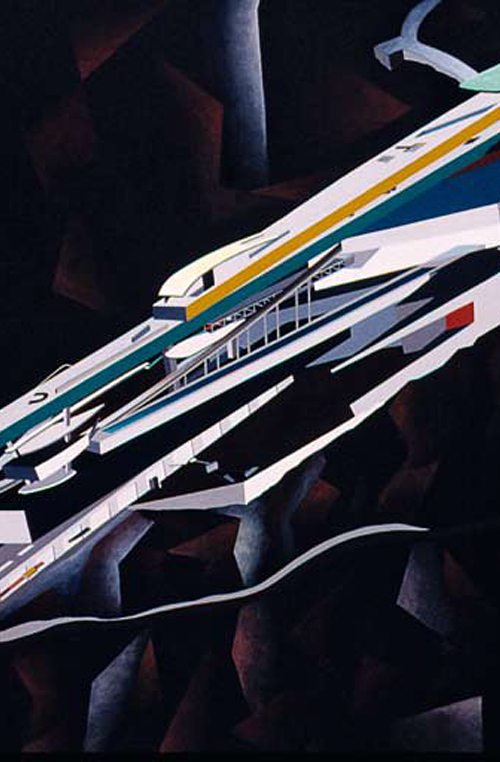 He began the first part, Complex One in 1972, and the earthwork and concrete forms resemble ancient urbanscapes. The artist himself has cited Zoser’s famed step pyramid outside Memphis (that is, in Egypt) as inspiration, while photographs of Heizer’s site immediately remind one of a Mayan great ball court. In the case of the LACMA setting, it evokes an ancient Roman arena or racetrack. Yet in City, as in the architectural setting for Levitated Mass, there is a decidedly sleek, minimal aesthetic to the architecture. I find much similarity between Heizer’s architectural work and that of Pritzker-laureate architect Zaha Hadid, especially her work of the 1980s and 1990s (The Peak, Hong Kong, unbuilt, and the Vitra Fire Station, for example). They have both been influenced by the Russian Constructivists (see Heizer’s Russian Constructivist Painting series from 1974). 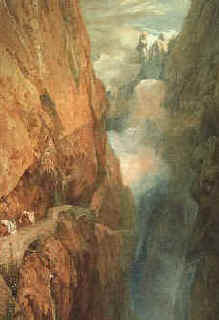 This is, doubtless, part of his success and part of his appeal: Heizer’s ability to synthesize Antiquity with Modernity. The perfect example was another LACMA commission. Heizer designed the 2010 exhibition Olmec: Colossal Masterworks of Ancient Mexico; especially notable were the platforms for the monumental Olmec heads on view in the show. The artist’s work here made sense, as he insists his aspiration is to be an absolutely American artist, making American art, and not beholden to the European tradition. Hence his references—spoken and visual—are to ancient Meso-American cultures (another example is his 1982-85 Effigy Tumuli, earthwork mounds at Buffalo Rock State Park, Illinois). Heizer, like so many others of his generation and the one prior, foreswore European models, working in New York City in the 1960s in the wake of Jackson Pollack and the rest of the New York School. Yet I would argue that Heizer, alongside a number of other contemporary artists such as Kapoor, should be considered within the tradition of the Sublime, an aesthetic theory operative in 18th-century Europe. The Sublime as aesthetic concept was codified in the 1757 treatise by Edmund Burke, Philosophical Enquiry into the Origin of our Ideas of the Sublime and Beautiful. Terror and simultaneous, quasi-religious wonderment inspired by Nature—whether the Swiss Alps or the roaring sea, as in popular representations by J.M.W. Turner—speak to fundamental human emotions. These sentiments express fear of Nature and its power over fragile humanity. Heizer’s evocation of a primordial world of awe and terror—paired with our presumptive technological and cultural triumph over Nature—are significant operative elements in the Land Art movement. My first encounter with Heizer’s work was some years ago at Dia:Beacon, which was directed at the time by Michael Govan before he moved to LACMA. First championing the artist there, he presented two great works which certainly changed my world view. The first, Heizer’s Negative Megalith 5 (1998), is a vertical slab of rock that has been set into a steel-lined niche. It mesmerized me; an ancient rock presented in a shallow reliquary-like niche, but on a monumental scale. An object of devotion, it inspired awe and mystery. 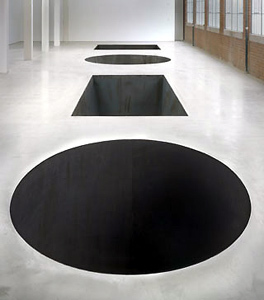 (Heizer has worked over decades with rocks set within concrete or metal boxes, subterranean or otherwise). 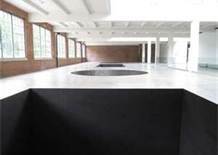 The second is a large-scale, indoor installation on permanent view at Dia:Beacon: North, East, South, West(1967/2002). It comprises four geometric shapes produced out of steel; negative spaces flush with the floor of the gallery, yet descending 20 feet down. As one approaches the edge of the vertiginous voids, one feels a frisson of danger as well as wonder at the sheer ingenuity and fabrication of the piece. With its references to Euclid’s geometry of shapes—the basic shapes of Western art—as well as Heizer’s frequent explorations of ideas of displacement and the play of negative and positive forms, this is an intellectually rigorous and astounding piece. 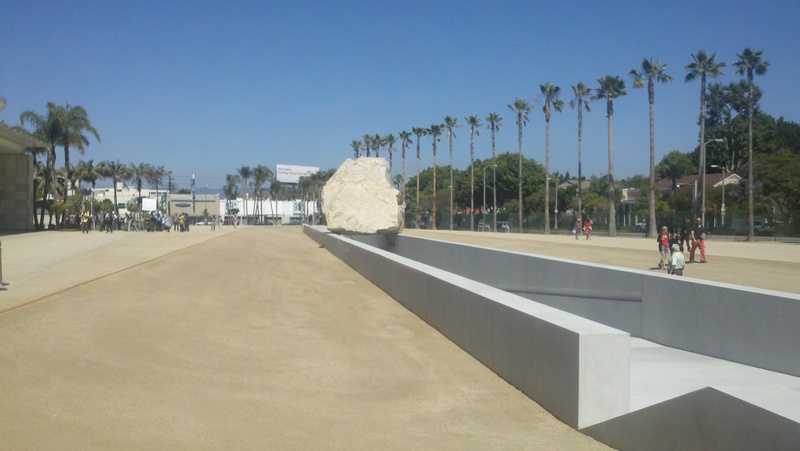 LACMA’s Levitated Mass joins the artist’s few major works—and in this particular case—the only monumental work—readily accessible to the public in a major urban center. It is a thing of both Antiquity and Modernity. As a civic monument, it is a splendid contribution and as a work of art—like Heizer’s best sculpture—it has the capacity to stir profound emotions. Note to Michael Heizer: In the sixteenth century a fellow named Michelangelo Buonarotti took not one but two boulders and with them created The Pieta and David. Try that some time, Michael.